Heat is the eternal enemy of computer equipment--leading to severe and costly damage to sensitive electronic components--and can be significantly exacerbated by the ever-present challenge of dust. Computer and server hardware is meant to dissipate internal heat generated by electronic components. Coating the components and solder, preventing heat from dissipating. Blocking air vents, leading to a rapid rise in internal temperature. The build-up of dust can (and surely does) impact your computer’s performance for two main reasons: it causes the components of your computer to retain heat and it makes it more difficult for the internal fans to dissipate heat from the system, thereby decreasing the efficiency of the entire system. How Does Dust Affect Your Computer’s Performance? When dealing with dust, conventional wisdom recommends increasing air flow to a space and allowing the HVAC filtration system to pick up the airborne particles. [...] increasing the airflow accelerates dust accumulation inside of the server’s chassis and around the electronic components. Dust accumulation on and around electronics components is bad news and will eventually lead to hardware failure. Dry dust is heavier than air and tends to form insulating blankets on top of electronic components. With no effective air contact, these insulated components can no longer be cooled and easily overheat enough to operate outside of their specified thermal range. Moist (or wet) dust is a partial conductor and is capable of initiating unwanted electrical shorts and high voltage discharges that destroy electronic components instantaneously. Cleaning computer equipment and servers, especially data rooms, is enough to make even the most experienced systems administrators panic. Done incorrectly, vital equipment can be damaged, leading to production downtime and costing businesses in the U.S., on average, hundreds of thousands of dollars per hour. As of December 2017, 24 percent of respondents worldwide reported the average hourly downtime cost of their servers as being between 301,000 and 400,000 U.S. dollars. Protecting computer equipment is relatively simple when compared to servers and data facilities, but dust is not the only issue--computer keyboards and mice are often home to a wide array of dangerous germs and bacteria. Supply users with disinfectant wipes certified safe for use with electronics to wipe down their mice and keyboards. Have the equipment routinely disinfected with an electrostatic disinfection appliance. Keep desks clutter free to avoid attracting dust and to simplify cleaning tasks. Keep computers off of the floor and do not block the air vents. Maintain a regularly cleaned office. Servers, specifically ones located in a data facility, are another matter entirely. Vacuum the floors, up to daily, depending on foot traffic. Clean the void above the false ceiling tiles on a yearly basis, and as needed. Clean the ceiling tiles every 6 months to one year. Clean the void between the plenum floor and the ground every 6 months to one year with a HEPA filtered vacuum. Wipe down external server cases and server racks at least every 6 months. Clean out the HVAC filters and service the ducts at least once per year. 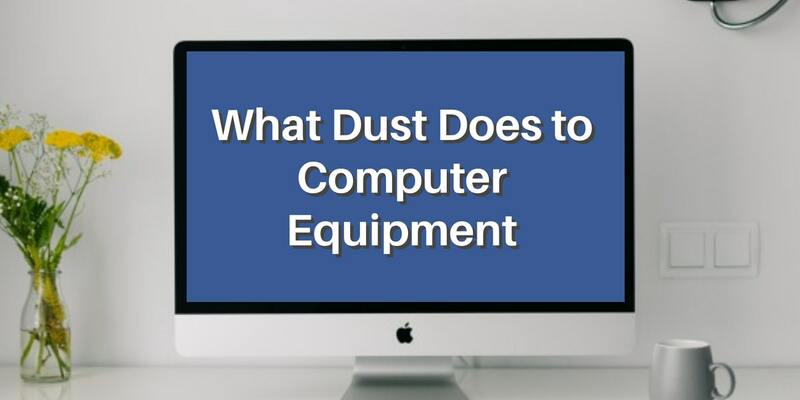 Dust represents a significant challenge for technology-focused businesses, especially those housing their own data facilities and server farms. Dust can cause high heat issues and provide conductivity for moisture in humid environments, especially where environmental controls are not in place. Obviously, not just anyone should be cleaning, disinfecting, or even touching the equipment that powers your business. A cost-effective solution is to partner with a vetted and highly trained service provider with all the necessary tools, cleaning supplies, and equipment necessary to quickly and competently address your facilities needs. If you would like to receive further information regarding the challenges surrounding dust and the cleaning of critical computer, server, and network equipment, or if you would like to schedule a free onsite consultation regarding all of your facilities cleaning and infection control needs, contact us today for a free quote!